Our 1 litre glass carafes are ideal for serving a variety of drinks at home or in the restaurant. They have an embossed grape logo on the base of the carafe and a size stamp on the side of the carafe. With a wide rim for easy pouring and made of thick glass they give robust service. Perfect for serving water or wine. 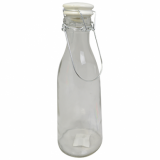 Sorry - We are out of stock of Glass Carafe (1 Litre).